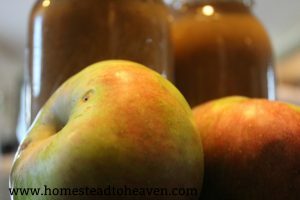 From harvesting the apples in the neighbors yard, to gathering again in the kitchen a few days later to make homemade applesauce, these are the moments to enjoy and savor. It was late in the morning. John and the kids and I finished up our various chores at the house before heading down the driveway to the neighbors’. The apples there were ripe (and over-ripe) for the picking. On our walk over, we met up with Mr. Neighbor who was just finishing up mowing the grass; while, up ahead, we could see that Mrs. Neighbor and their kids had just arrived home from the store. We were just in time. Somehow, John, Mr. Neighbor, and I ended up being the ones harvesting the apples, while the kids were off playing with the neighbors’ kids and their farm animals. Occasionally we’d get them to come by and help pick up the good apples that we had shaken from the parts of the tree that couldn’t be reached. And, of course, the 1 year old was busy filling his belly with apples and pears so that we could have the pleasure of changing a few more smelly diapers than we would have liked. 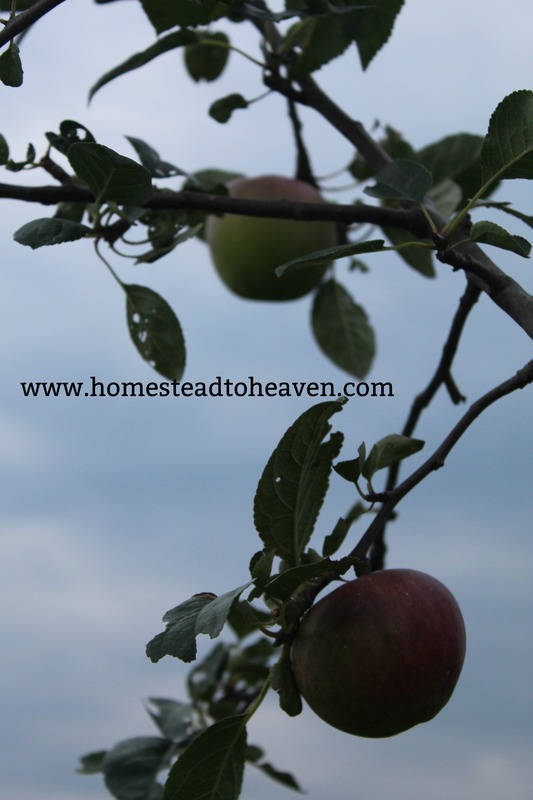 The time passed quickly with apples, laughter, and conversation all mixed together. 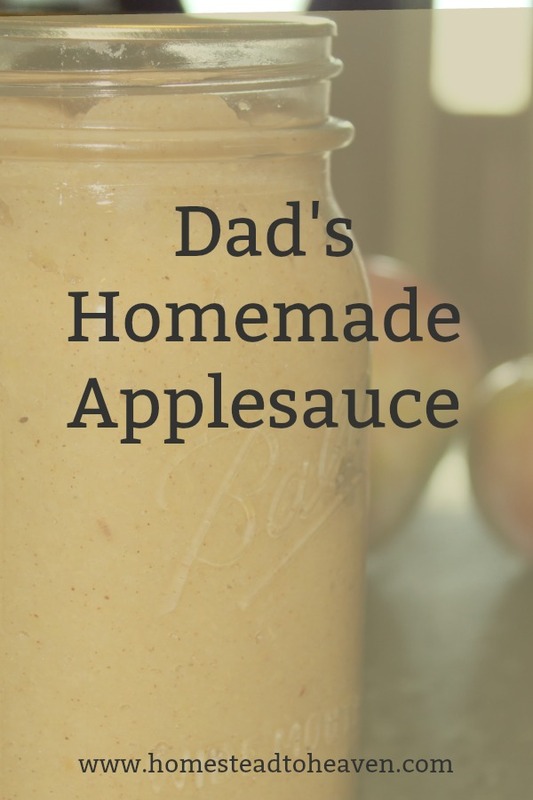 It was just a few evenings later that we met again at my parent’s house to make my dad’s homemade applesauce. 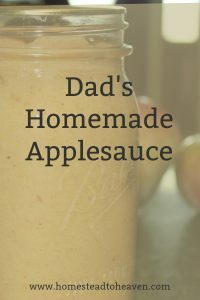 A lot of applesauce recipes online call for peeling and coring the apples, cooking them down, and finally mashing them. Thankfully, my dad has this nifty do-hicky that does a lot of the hard work for you. There were about four of us, with knives in hand, ready to cut out the bruised and wormy parts, then cut the apples into quarters. With so many hands, it didn’t take long to fill three stock-pots with the quartered apples – skin, cores, and all. Dad was in charge, directing tasks and manning the stove, as we filled each pot. By the time the apples were nice and mushy, a few of us had to cycle through helping with the applesauce and helping with the babies who were starting to get a little tired and fussy. Even with the division of labor, it didn’t take long before we were spitting out sweet and smooth applesauce. Those cooked down apples went right into that do-hicky (food processor); one side spit out the seeds and skins, while the other side pushed out the lovely smooth applesauce. My dad added in some cinnamon and a little bit of the apple juice from the pot back in until it was at his desired consistency. That applesauce was then loaded right into jars to be canned in a water bath canner. In a span of 1 1/2 hours and 6 or so people, we had ourselves about 14 or more quarts of deliciously golden applesauce. P.S. I didn’t have the forethought to take any pictures during the process, and it took three of us to figure out how to take a picture of the finished product.